Somewhere between the puree approach and baby led weaning, I found a middle ground, and I wanted to share it because there are really so few options out there for introducing solids and meals to babies and toddlers. *more recipes and chit chat on my FB community here. > Food Adventure 1: Touch/Tactile – Exploring food with both hands…and face. > Food Adventure 3: Sound – the thrill of snap, crackle, & crunch! I wouldn’t say it’s a radical departure from either of the approaches above, but it’s definitely an in-between, plus adds some additional elements that I haven’t seen enough of; like the importance of incorporating sense exploration. ← Research is pointing out the importance of this more and more, as you’ll see below. On the scale of puree to BLW, I’m definitely way more on the BLW side, I absolutely love the food exploring, the hands-on style, the self-regulating, the adventurous spirit of it. But I found it to be a bit too grown up at times… and I found myself (still now) making finger food more accessible in various ways. Mostly by making them more bite size, sometimes mashing. I suspect there are more parents like me who are doing BLW this ‘softcore’ way; supplementing major food exploration with more manageable hands-on meals. 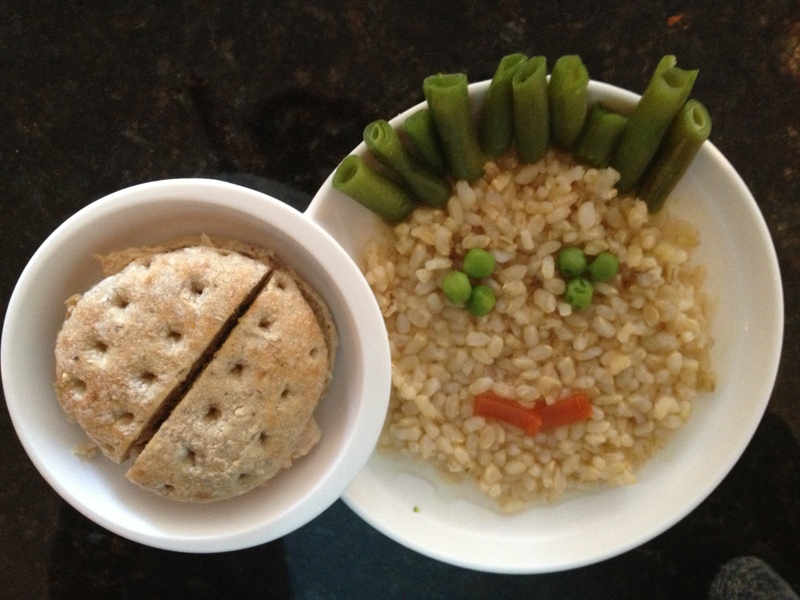 BLW foods don’t always have to be big and tricky, do they? Yet somehow I felt like rice and tiny cut up veggies was cheating? This is why I wanted to share the approach we took, and put it out there for others that might be feeling like I was; that I needed something in between. Don’t be fooled by the spoon below – the spoon feeding only lasted about a month or less, but yes, that’s how we started…. 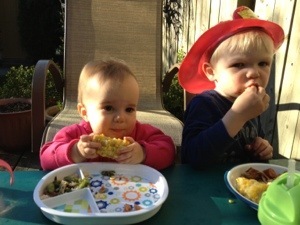 Avocado mash (above) at 6 months, corn on the cob (below) at 12 months. So. Where does this leave us? The best way to describe what we did is what I’m calling THE 5 SENSES METHOD. What’s it about? Quite simply, the great human adventure of starting to eat and appreciate food; and how the awareness of taste, smell, sound, sight, and touch is key to that. Practically speaking, this method is about serving 80% of meals as bite size finger foods made from grains, meats, and vegetables. Choosing (or designing) meals that are colourful, interesting, and aromatic but still unprocessed, nutritionally dense, and in most cases ‘whole’ like a grain of rice or a piece of fruit. The other 20% of the time; having fun with texturally challenging, ‘bigger’ whole foods, and helping baby learn how to manage the little obstacles that come with eating grown-up sized table food. Independent eating, yes – all the way. But also simple and gentle, with an appreciation for flavour variety, shape, aroma, & texture. 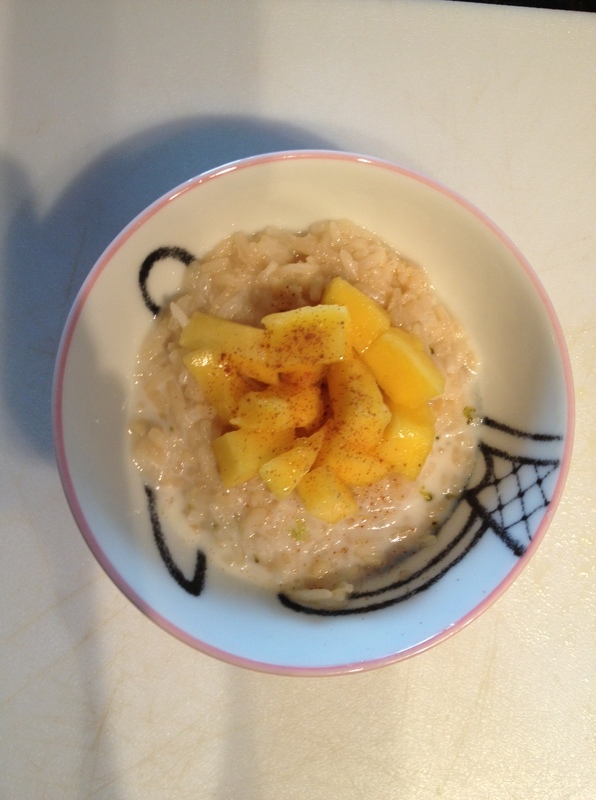 Mango sticky rice at 9 months above, veggie dinner at 10 mos. Veggie Dinner at 10 mos. Recent research has shown that everything from colour and shape to what music playing in the background affects our perception of flavour. The more I’ve thought about this, the more I’ve realized that what really doesn’t come across in either puree or BLWing is how important it is for babies and toddlers to be stimulated by and interested in what we’re feeding them. But also, how important it is that we share in their flavour experience, and delight in the food we’re providing as much as we want them to delight in eating it. Food Adventure 1: Touch/Tactile – Exploring food with both hands…and face. 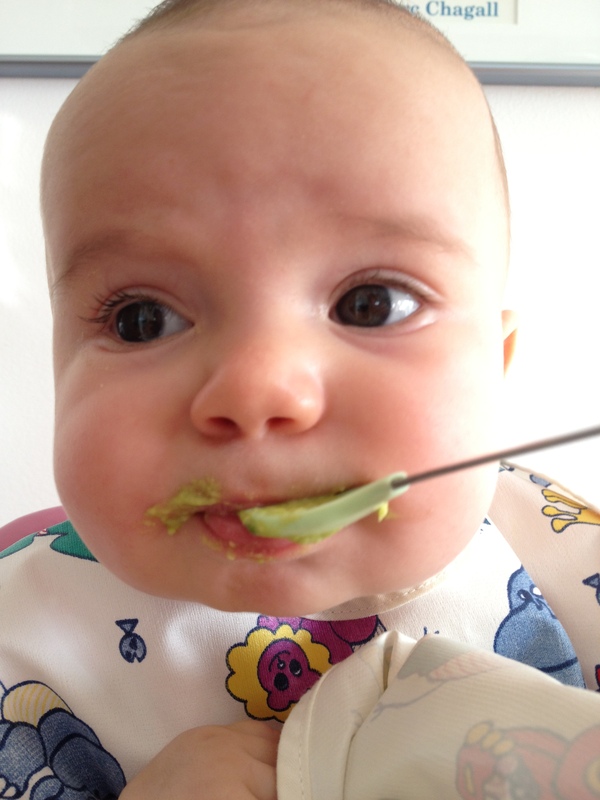 BLW does the best job of introducing this concept; letting the baby explore food freely, and feed themselves. The part of this that I’ve really found great value in is how babies take so easily to the concept of a “whole” food — I was amazed to see my daughter navigate whole fruits, eggs… even a chicken drumstick at nine months old. While I don’t think this type of eating is necessarily practical for every meal, it’s really important to experiment with soft textured whole foods. Smaller ‘whole’ foods like brown rice and well-steamed broccoli were absolute staples. Examples to try: partly peeled bananas, whole tomatoes, and peeled oranges (acidic foods only weekly though, not daily). Avocado,ends of bread. Colourful, messy, tactile foods like Lasagna and Spaghetti with prima vera sauce, mango sticky rice, dried fruit, large piece of baguette to gnaw on, burgers/slider patties. Smell is the most advanced sense that babies have at birth. We know that babies can smell their moms from across the room – that super sniffing power comes into play with real food too. I love the way my friends did this with their baby; they’d have their son in the bouncy chair while they cooked, and would let him smell the basil, mint and whatever other fresh ingredients they were chopping as they cooked. Did that baby grow up to eat everything? Yup. And we did the same thing for just that reason. (And it worked out pretty well for us too). 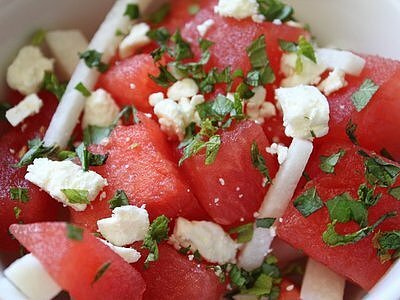 Aromatic examples to try: Italian-herb pesto pasta and sauce, indian food, watermelon salad, smell/taste exploration with mint, basil, and other delicate herbs. There’s growing evidence for the idea that sound affects taste, including the concept that we derive direct enjoyment from the crackle of a Rice Krispie or the crunch of crudités. *Also, play music at meal time… not kid music … real, enjoyable music that’s fun and will make you smile. It’s infectious, and creates that important association between smiles, fun and eating. The simplest of all. But maybe not so simple, now that research is proving how powerfully other circumstances influence it. The best example I have of a culture that does taste adventure well is the French — who entrust their youngsters with leek soup and baguettes practically from birth. Big credit to my husband, the true epicure, who has always been a master of flavour and definitely brave when it came to letting our daughter explore tastes. I’m so glad he did – I think that his natural passion for new things and sharing flavor adventures has been a wonderful influence on RZ, who does eat almost anything. Flavour-experience foods: baby-green fried rice, miso soup, jambalaya, pesto pasta with chicken. What I like about this style of eating is that it’s such a good introduction to how we eat, ideally, as adults; taking pleasure in the different elements of food and flavour, appreciating the way food looks on a plate, and taking great enjoyment out of a hearty slurp, bite, or crunch. For adults, it’s about a pop of green or red, a beautiful browned crispy edge, or the bright hues of fresh veggies and citrus. The natural joy of enjoying food with our eyes is something we carry with us for life. For babies and toddlers, we need to pass on the knowledge that food is a delicate art that time and effort goes into. It’s not about spending an hour in the kitchen working on the presentation of the babies food, but it could be taking an extra 10 minutes or so to consider how a meal can an an extra bit of twinkle to those big, beautiful, eyes and curious baby faces…. By the age of 2, you’ll be hearing words “hair”, “eyes”, “green”, “smile”… “happy”… food can help bring the world of shapes and colours and names of things to life. What do you think? As always, I’d love to hear your thoughts. I want to do more but have a lot of worry about choking. He gags a lot, and has vomited a couple of times while eating (though it has never seemed to result directly from choking). Is this ok, and just a normal part of the learning process? When he eats finger foods he will bite off a too-large chunk and then I just worry that he will try to swallow the whole thing and end up choking. Any thoughts or advice appreciated! The gagging is normal according to BLW, but I don’t know about the vomitting – if it’s particular foods he’s not able to handle maybe leave those out for a few months and try other things. Brown rice and well-steamed broccoli were staples for us – you could give those a try too. Spiral pasta is also great. 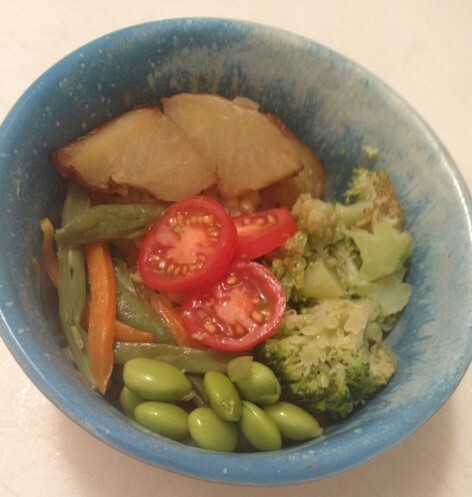 You really just have to keep adapting with their growth and moods; my daughter was all about rice one month, all about meat the next – sometimese into berries, other times green veggies. I think it depends not just on what age (in months) they’re at but also growth spurts, teething, and level of tiredness or hunger. 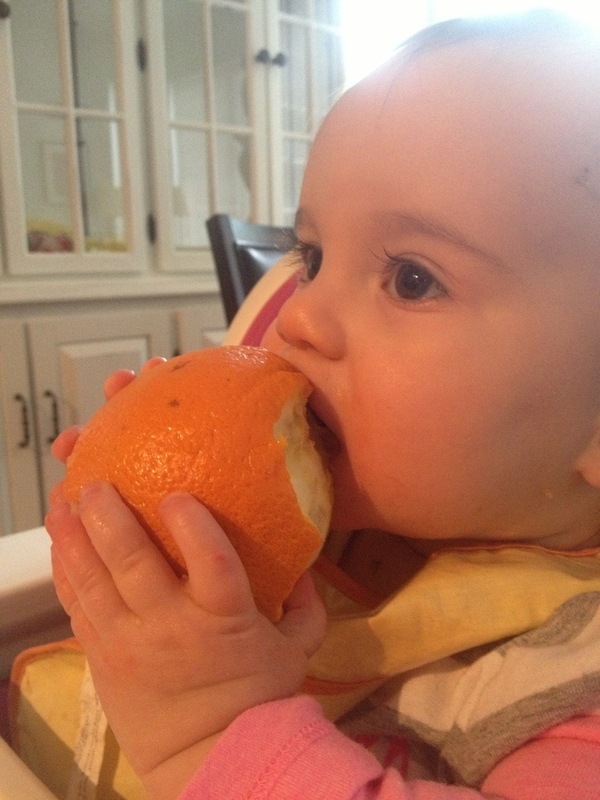 Babies have their food moods just like us. Find your go-to staple meals and then build off that.